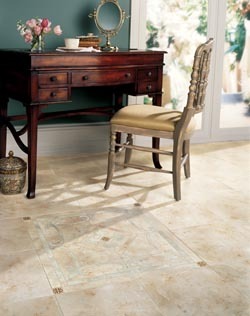 Luxury Vinyl Tiles | Swansea, ILWe have a new 800 number, but you can still call us at 618-234-2915 if you prefer. Get the best fit possible for every room in your home when you start your new flooring project at Collins Flooring America. Every design plan we read is different in some way, and many of our customers need a variety of luxury vinyl tiles in Swansea, IL. Our design team is eager to help you complete the home of your dreams, and that starts with practical flooring solutions and great warranties on products and installation services. Bring in a copy of your design plan and any samples you may have. Our flooring specialists can quickly identify a series of tiles that fit your needs and your outlook on style. Each type of floor covering has a series of advantages depending on the room in question. While the character and charm of natural hardwood flooring is a great choice for a den or a dining room, it doesn’t perform as well in places with higher levels of moisture. Find the floors you need for your bathrooms, kitchen, and laundry room at our flooring center. In the hands of a creative installation professional, a series of vinyl tiles can be arranged in an original pattern that is sure to impress your neighbors and friends. A luxury vinyl tile floor gives you the look and feel of natural wood, slate, and tile with the added resiliency of vinyl. Your new surface provides you with added give, so those hours spent standing in the kitchen won’t have as much of an impact on your back. The ease of maintenance can also improve the air quality in your home. A vinyl floor features fewer places for dust and dirt to hide, which makes breathing easier. When you save money on the luxury vinyl tiles you purchase for the kitchen you have more to devote to other areas of the home. Just bring in your design plan and learn about the possibilities that come with value-added flooring. Our experience with luxury vinyl tile floor installation makes a difference in the long run. We have the tools and training needed to get the best fit for your flooring purchase. These contractors take the time to ensure the job is done right the first time, so you don’t have to worry about warping and water damage to the subfloor. Take advantage of the functionality and appeal of this innovative new flooring option. Contact us today to start choosing the luxury vinyl tiles for your bathroom and kitchen renovation. We proudly serve customers in Swansea, Belleville, Fairview Heights, Waterloo, Collinsville, Illinois, and the surrounding communities.